Bovina is located at 34°30′49″N 102°52′59″W﻿ / ﻿34.51361°N 102.88306°W﻿ / 34.51361; -102.88306. In the city, the population was spread out with 37.6% under the age of 18, 9.5% from 18 to 24, 27.9% from 25 to 44, 16.2% from 45 to 64, and 8.8% who were 65 years of age or older. The median age was 28 years. For every 100 females, there were 101.1 males. For every 100 females age 18 and over, there were 93.5 males. The median income for a household in the city was $27,426, and the median income for a family was $29,602. Males had a median income of $25,417 versus $18,036 for females. The per capita income for the city was $10,995. About 16.8% of families and 20.8% of the population were below the poverty line, including 24.0% of those under age 18 and 17.3% of those age 65 or over. In 1976, Bovina adopted the city manager form of government, with Larry D. Gilley first filling the position. Gilley later became the manager in Abilene and San Marcos, Texas. The last city manager was Ernest Terry, who served from 2001-2007. Terry later became the manager in Fritch, Texas. Currently filling the position as City Manager is Cesar Marquez. Early in his career, the Texas educator and firefighter Pat Barrett taught agricultural studies at Bovina High School. Actors Ben and Butch McCain grew up in Bovina. One of the best-known Bovina residents was John Elmo Sherrill, Jr. (1925–2007), who held four different public offices in Bovina and Parmer County, including Bovina alderman, mayor (1956–1960), school board member, and city judge (1997–2007). The City of Bovina is served by the Bovina Independent School District. The high school's mascot is the Mustang. Its colors are maroon and white. Bovina's rival are Farwell and Friona. ^ a b c "Bovina". Geographic Names Information System. United States Geological Survey. ^ "Bovina, Texas". Handbook of Texas. Retrieved 7 May 2015. ^ Haley, J. Evetts (1929). The XIT Ranch of Texas: And the Early Days of the Llano Estacado. Norman: University of Oklahoma Press. pp. 148–149. ISBN 0806114282. ^ "Pat Barrett". Lubbock Avalanche-Journal, April 8, 2010. Retrieved April 19, 2010. 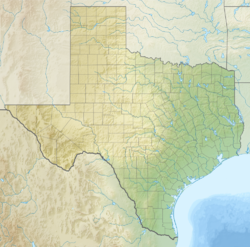 Wikimedia Commons has media related to Bovina, Texas. This page was last edited on 19 December 2018, at 00:17 (UTC).